It can’t happen here! What is happening in Venezuela and Argentina cannot occur in Western economies. That’s at least what markets believe with stocks and most bubble assets remaining in cloud cuckoo land. Rates in Argentina have just gone to 40% to protect the currency. Anyone who believes that rates in the US will remain at current low levels or that German and Japanese rates will remain negative has a massive shock coming. 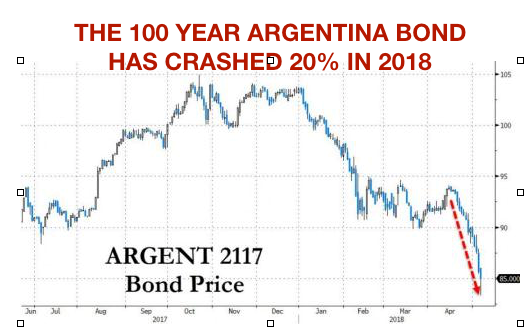 Argentina used to be a very strong economy 100 years ago but in the last few decades the country has gone through several economic collapses and hyperinflation. Argentina just increased short term rates to 40% to defend the currency. 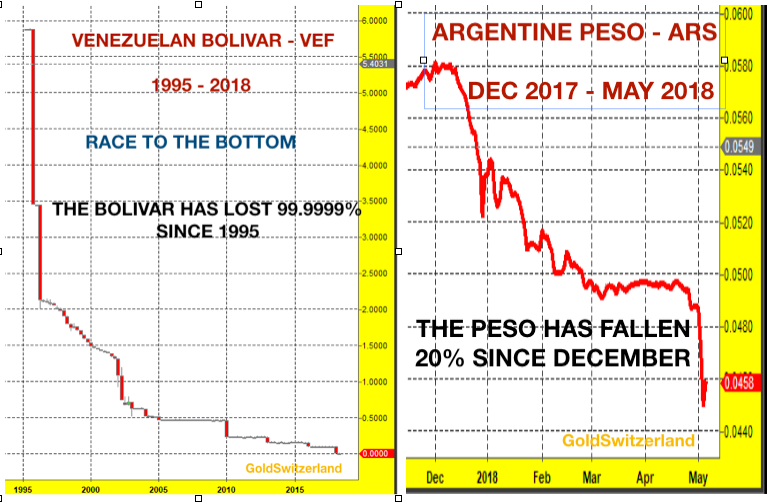 The Peso has declined 95% since 2001 and is on its way to zero. So it is quickly catching up with another South American country – Venezuela. The official Bolivar is down 99.7% against the dollar since 1995. The black market rate is much worse. Don’t believe that the dollar in any way should be proud over its outperformance against the Bolivar and Peso. 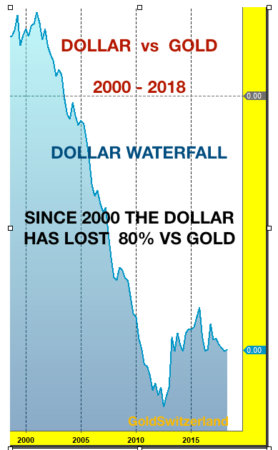 Since 1999 the dollar is down 80% against real money which is gold of course. The Venezuelans and Argentinians would have done very well since the late 1990s to hold dollars rather than their own currency. But if they, as well as the Americans, had held their savings in real money – Gold – they would today live like kings in their home country. I am amazed how few people understand the importance of history and economics. I meet many Family Offices whose main objective should be to preserve generational wealth. Very few of them hold gold or understand the importance of gold for wealth preservation purposes. They don’t understand what is happening in Argentina and Venezuela will also happen in many Western countries. I also meet people with less wealth and most think that having gold is ridiculous and serves no purpose. “You can’t eat gold” is a very common remark. They don’t realise that people in Venezuela can’t eat the Bolivar either but if they owned gold, they would be able to buy food or whatever else they needed. In my article last week I showed the charts of gold in Pesos and Bolivars. Gold is such a simple method to preserve wealth but it is a secret that virtually nobody knows or understands. In every period of economic depression, hyperinflation or political oppression (like the Asians in Uganda in the 1970s), gold has always been the saviour of the people who own it. Since Nixon took the disastrous decision to decouple the world’s monetary system from gold, we have seen a free for all money printing bonanza that has destroyed the value of all currencies and created massive credit and asset bubbles around the world. Investors and money managers have been under the illusion that it was their skill that has generated this enormous wealth. Few have understood that central bankers have created the global Ponzi scheme of all time which has put a giant rocket under most assets and driven them to the stratosphere. And even fewer people understand that this rocket will fall down to earth without all the bubbles which will evaporate in space. As this happens, the West will do exactly what Venezuela and Argentina are doing today. They will print unlimited amounts of money and create debt on an exponential scale. The central banks are most probably aware that they can’t solve a debt problem by creating more debt. But they will be totally clueless what else to do. They will at that point lose control of interest rates. The market will take over, as it should do, and rates will rise dramatically. Manipulation always ends in tears. The long end of the market will dump bonds, driving rates to the teens and probably much higher. This is what is happening in Argentina right now with short term rates at 40%. Last year they issued a 100 year dollar bond of $2.75 billion at a yield of 7.9%. The bond was 3.5X over subscribed! How can anyone of a sound mind buy a 100 year bond issued by a country that time and time again has defaulted on its debt and devalued its currency. We all know why they did it – GREED of course. At the time US 30 year rates were sub 3% so an 8% return seemed very attractive. The 100 year bond has crashed 20% since January this year. It will come down a lot more. I remember the same kind of greed in the 1970s. Swiss rates were then around 2% and UK rates were 15%. Many UK companies borrowed in Swiss francs. The only problem was that from 1972 to 1978 the pound against the Swiss franc fell from 10 to 3, a 70% fall. This meant that someone borrowing CHF 1 million which was £100,000 in 1972 owed £333,000 in 1978. So saving a few percentage points on interest was not very clever when the debt went up 3.3X ! I know many borrowers who went under due to this unsound currency mismatch. People never learn. High rates means high risk. There is a reason why Argentina paid 8% when US rates were 3%. Argentina has an appalling record of economic management and is not a sound borrower. And Swiss rates were low because the economic policies of the country were extremely sound whilst the UK had massive economic problems which led to economic collapse, inflation and a crashing currency. The US is now an extremely badly managed economy that has lived above its means for 60 years. The chart below shows US deficits since 1968. The surplus Clinton years were not real. They were fake figures as US debt increased every year that a surplus was shown. In fact, US debt has gone up every year, without exception, since 1957. 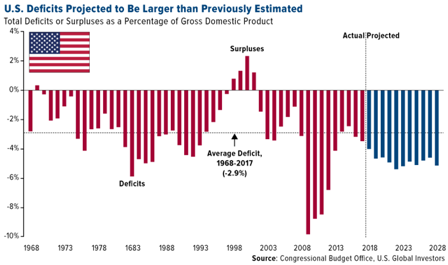 As the chart shows, the deficits are expected to continue at a high level for years to come. In my view that forecast is much too optimistic. So there we have it. The “strongest” economy in the world has for 60 years lived on borrowed and printed money. Hard to call that a strong economy. This has all been possible due to the Petrodollar and the US military might. But that is now coming to an end. The dollar is backed by nothing but debt and it will soon accelerate its fall to zero just like the Bolivar and Peso. And according to independent experts, the Russian and Chinese military power and sophistication is far superior to that of the US. In the next few years, the South American contagion is going to spread rapidly to the US and also to Europe, Japan, China and many more countries. The fake money and mega debt party is over. The world will soon suffer the consequences of the sybaritic times that the US and the West have created. And those consequences will be of a magnitude that few can realise today. China does know what is going to happen. 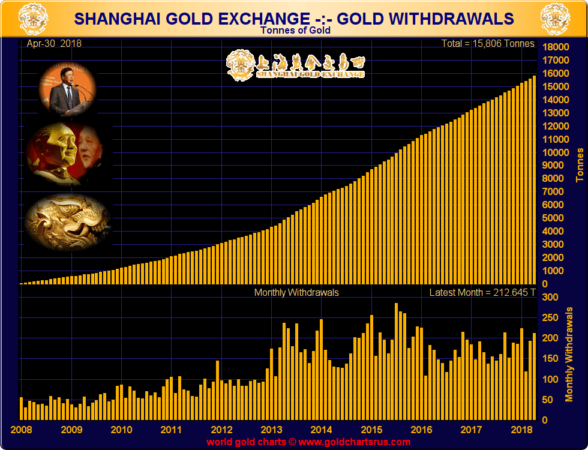 That is why the Chinese are continuing to accumulate gold in enormous quantities. They added another 212 tonnes last month and have bought almost 16,000 tonnes of gold since 2008 which is the majority of the world mine production. So it is now time to batten down the hatches and take all the protection that we can. The Argentinians and Venezuelans would have avoided misery by holding gold instead of paper money. It is now too late for them as they have little money left. But there is time for Americans, Europeans and other nations to protect themselves today by owning physical gold and silver. Anyone who doesn’t heed this warning is certain to regret it in coming years. Just follow the wisdom of the East who understand the importance of gold and history, as the chart above shows.